Dundee freemasons are celebrating a posthumous pardon granted to a heavyweight boxing hero. The son of former slaves, Jack Johnson was born in Texas in 1878 and held the heavyweight title from 1908-15. He fought in exhibition matches in Newcastle in 1911. Army officer Sydney McLaglen was also boxing there and told Johnson about his masonic lodge. He told Johnson he was due to travel to Dundee to have his second degree conferred and asked if it would be possible to go with him and join the lodge. The heavyweight champion travelled up from Newcastle and on October 13 1911, became a freemason in Forfar and Kincardine, No. 225 Lodge, in Dundee. Past Master Graham Letford said: “Grand Lodge sent a telegram to the Provincial Grand Lodge of Forfarshire ordering them to stop the initiation. “But the door was locked during Jack Johnson’s initiation and when the telegram arrived the deed had already been done. “This cost the master at the time a two-year suspension. Johnson left by train for Newcastle after the ceremony. A reporter from the Dundee Advertiser spoke to Johnson in Leeds who told him he was proud to belong to the craft. Johnson said: “All I want is fair treatment, and I don’t want nothing bestowed on me I don’t deserve, if there is anything to say well it’s for the Lodge and other people. “But there is no doubt about it you are a Mason?” asked the reporter. “They can’t say anything about me”. He denied that there was any “squabble” and refused to say anything further on that point. “You have a high opinion of Freemasonry then?” he was asked. Johnson replied: “It’s the greatest thing in the world, it’s wonderful. “I have always wanted to be a member and I chose the Dundee Lodge because it is one of the oldest and one of the most substantial. “I am proud I can tell you. “I am a Freemason and as long as I live I shall be one. “Only God almighty can undo that”. Johnson concluded by emphatically stating he would certainly go back to Dundee to have his second degree conferred some time in early December. The champion did not return to Dundee following the 18-month suspension of the Lodge. He was convicted by an all-white jury in 1913 of taking a woman across state lines for “immoral purposes”. Johnson, whose consensual relationship with a white woman was seen by many at the time as taboo, fled to Europe but returned in 1920 and spent a year in prison. Mr Letford said: “Johnson’s pardon is great news for the lodge and great news for the masons of Scotland. 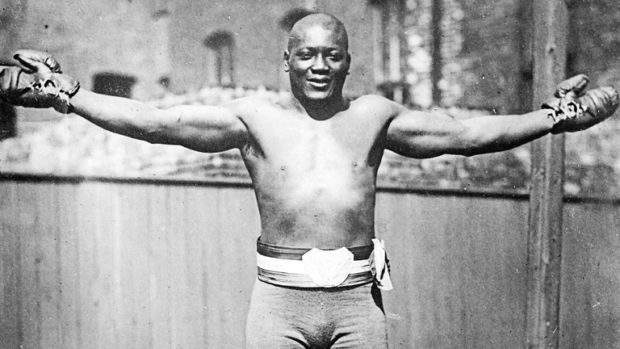 Johnson claimed the title of “World Coloured Heavyweight Champion” in 1903, before becoming overall World Heavyweight Champion in 1908, after winning a fight in Australia against a white boxer from Canada. He died in a car crash in 1946 at the age of 68.